This name uses Eastern Slavic naming customs; the patronymic is Vladasovichand the family name is Grachyov. Vitáliy Vladasovich Grachyov (Russian :Вита́лий Владасович Грачёв, tr. Vitály Vladasovich Grachyov; born 19 February 1979), known professionally as Vitas (Russian :Ви́тас, tr. Vitas,IPA: [ˈvʲitəs] ) is a Russian singer. He is known for his unique falsetto and for possessing a near five-octave vocal range, which he displays when performing his "turkey call" in "The 7th Element" and his trademark falsetto choruses. His eclectic musical style incorporates elements of techno, dance, classical, jazz, and folk music. His song "Opera 2" and the music video for "The 7th Element"  went viral across various social networks frequently, accounting for much of his worldwide recognition. Falsetto is the vocal register occupying the frequency range just above the modal voice register and overlapping with it by approximately one octave. Odessa is the third most populous city of Ukraine and a major tourism center, seaport and transport hub located on the north-western shore of the Black Sea. It is also the administrative center of the Odessa Oblast and a multi-ethnic cultural centre. Odessa is sometimes called the "pearl of the Black Sea", the "South Capital", and "Southern Palmyra". Before the Tsarist establishment of Odessa, an ancient Greek settlement existed at its location as elsewhere along the north-western Black Sea coast. A more recent Tatar settlement was also founded at the location by Hacı I Giray, the Khan of Crimea in 1440 that was named after him as "Hacıbey". After a period of Lithuanian Grand Duchy control, Hacibey and surroundings became part of the domain of the Ottomans in 1529 and remained there until the empire's defeat in the Russo-Turkish War of 1792. Lucio Dalla, OMRI was an Italian singer-songwriter, musician and actor. He also played clarinet and keyboards. 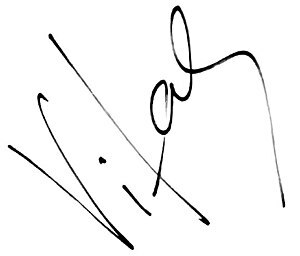 In October 2007, Vitas was signed with now-defunct American label Gemini Sun Records. Gemini Sun has released the Audio Visual Connect Series Vitas compilation CD + DVD set featuring 8 music videos with the corresponding songs also on audio CD, plus a bonus audio track. In 2008, he also released Light of A New Day, a 40-minute track of non-lyrical vocalization and instrumentation. The song is available as a free download on his website. Vitas has been known to be secretive about his personal life and has frequently declined interviews about it. He married his wife, Svetlana, in 2006. [ citation needed ] They have a daughter and a son. Vitas was arrested on 10 May 2013 for hitting a cyclist with his car. Russian TV channels Russia-1  and Channel One Russia  reported widely on the accident. These and other TV channels displayed Vitas' driving license with his personal data, which had been presented to journalists by a police officer. The incident took place just northeast of Moscow, near the VVC Exhibition Centre. The cyclist was not hurt and proceeded to film the situation that took place with the police afterward. The video depicts an unshaven and swaying Vitas being held by authorities; concerts planned in China that year were canceled. 2007 Best Album – NewsMusic Poll  "Crane's Crying"
2011 International Song Writers Contest Winner, 3rd place Music Video Category for "Opera #2". Also won second place in People's Choice vote. "Opera #2"
Coco Lee is a Hong Kong-born American singer-songwriter, record producer, dancer, and actress. 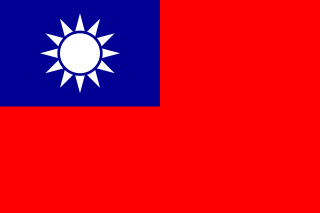 Lee's career began in Hong Kong and then expanded to Taiwan. Her single, "Do You Want My Love" also entered the US music charts. Her first full-length English language album was Just No Other Way. As a Chinese American, Lee is the first and only person of Chinese ethnicity to perform at the Oscars; she performed the Best Original Song nominated, "A Love Before Time" from the movie Crouching Tiger, Hidden Dragon. Cui Jian is a Beijing-based Chinese singer-songwriter, trumpeter and guitarist. Affectionately called "Old Cui", he pioneered Chinese rock music. 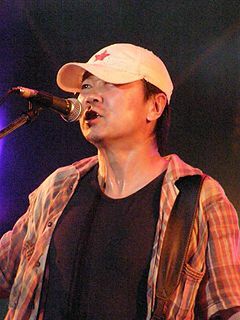 For this distinction Cui Jian is often labeled "The Father of Chinese Rock". Kulilay Amit, better known by her stage name A-Mei, is a Taiwanese Puyuma singer and record producer. In 1996, she made her singing debut and released her album, Sisters. 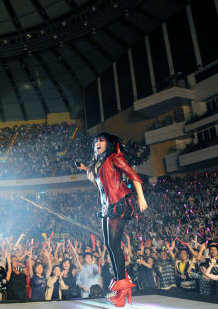 Her albums, Truth (2001), Amit (2009), and Faces of Paranoia (2014), each won her a Golden Melody Award for Best Mandarin Female Singer, and made her one of the singers who won the category the most times. Having sold more than 50 million records, she has achieved success in Mandarin-speaking world, and she is often referred to as the "Queen of Mandopop". Rufus McGarrigle Wainwright is an American-Canadian singer, songwriter, and composer. He has recorded seven albums of original music and numerous tracks on compilations and film soundtracks. He has also written a classical opera and set Shakespeare sonnets to music for a theater piece by Robert Wilson. Brainstorm is a Latvian pop/rock band. The band became popular internationally in 2000, when they finished third in the Eurovision Song Contest 2000 with the song "My Star". 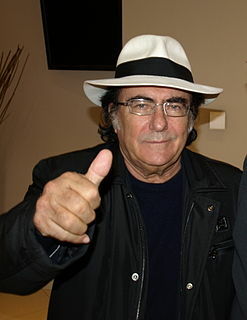 Albano Carrisi, better known as Al Bano, is an Italian recording artist, actor, and winemaker. In 2016, he was awarded Albanian citizenship due to his close ties with the country. Aria is a Russian heavy metal band that was formed in 1985 in Moscow. Although it was not the first Soviet band to play heavy music, Aria was the first to break through to mainstream media and commercial success. According to several public polls, Aria ranks among top 10 most popular Russian rock bands. Their sound resembled that of NWOBHM bands, for which they were dubbed the "Russian Iron Maiden" in the media. Alexander Borisovich Gradsky is a Russian rock singer, bard, multi-instrumentalist and composer. He was one of the earliest performers of rock music in Russia. His diverse repertoire includes rock 'n' roll, traditional folk songs performed with a rock twist, and operatic arias. He has composed two rock operas and numerous songs including soundtrack music for several films. Kipelov is a Russian heavy metal band formed and led by former Aria vocalist Valery Kipelov. Philosophy of Miracle is the debut album by Russian singer Vitas, released in 2001. It is sometimes translated as Philosophy of a Miracle, Philosophy of Wonder, or Wonders of Philosophy. The album received widespread popularity in mid-2011 after "The 7th Element" and "Opera 2" gained popularity several years earlier. 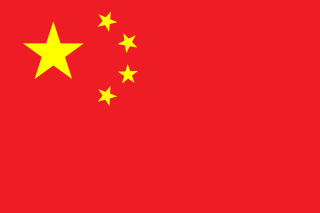 It has reportedly sold at least 3.5 million copies in China alone. All the songs were written or co-written by Vitas, with the exception of "Prelude" by Dmitri Plachkovsky. The album was recorded with many backing musicians including the Vienna Symphony Orchestra. Neon magazine described the album as "fresh, original, new and therefore interesting". Smile! is a Russian album by Vitas (Витас), released in 2002. Several songs from this album featured in his Philosophy of Miracle concert programme, whose performance at the Kremlin earned Vitas a record as the youngest artist to perform a solo concert at the State Kremlin Palace; a DVD of this concert was later released. Mama is a Russian album by Vitas. It was released in 2003, simultaneously with The Songs of My Mother. Both albums were a tribute to his late mother. Songs from these albums featured heavily in the setlist of Vitas' extensive world tour The Songs of My Mother, performed at hundreds of venues in several countries from 2004-2006. The Songs of My Mother is a Russian album by the singer Vitas. It was released in 2003, simultaneously with Mama. Both albums were a tribute to his late mother. Songs from these albums featured heavily in the setlist of Vitas' extensive world tour The Songs of My Mother, performed at hundreds of venues in several countries from 2004-2006. The Colour of My Love Concert is the second home video by Canadian singer Celine Dion, released on VHS on 19 October 1995 and on DVD on 6 January 1998. It was filmed in September 1993 at Le Théàtre Capitole in Quebec City, Canada and aired in December 1993 in Canada on CTV and in February 1994 in the United States on Disney Channel. Dmitry Aleksandrovich Koldun is a pop singer from Minsk, Belarus. Alessandro Lindblad, commonly known by his stage name Alesso, is a Swedish DJ and record producer. Alesso is managed by John Shahidi of Shots Studios. Dinmukhamed Kanatuly Kudaibergen is a Kazakh singer, songwriter and multi-instrumentalist. He is university trained in classical as well as in contemporary music and is known for his wide vocal range of 6 octaves and 2 semitones, from C2 to D8. This spans from the bottom of the bass range beyond the top of the soprano range. Kudaibergen has performed songs in twelve different languages, his native language Kazakh as well as Russian, Mandarin, English, French, Ukrainian, Italian, Turkish, Serbian, Kyrgyz, German, and Spanish. 1 2 3 4 5 "Discography. Albums and singles. - Vitas' official website". 1 2 3 4 "Vitas' official site. Press release". Vitas.com.ru. Archived from the original on 3 September 2007. Retrieved 28 September 2010. 1 2 "Gemini Sun Records Press Release". Vitas.com.ru. 29 January 2008. Archived from the original on 29 July 2013. Retrieved 28 September 2010. ↑ "Vitas'official site. News". Vitas.com.ru. Archived from the original on 28 September 2010. Retrieved 28 September 2010. ↑ "《花木兰》电影官方网站". 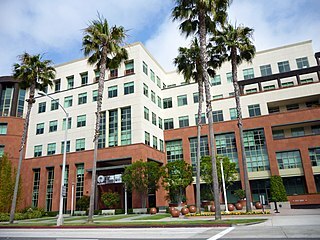 Mulan.ent.sina.com.cn. Retrieved 28 September 2010. ↑ "Vitas Guest Stars in 'Mulan' – AsianFanatics Forum". Asianfanatics.net. 20 April 2009. Retrieved 28 September 2010. ↑ "Reddit - Videos". www.reddit.com. Retrieved 2016-11-20. ↑ "Vitas". www.facebook.com. Retrieved 2017-12-22. ↑ "亲，访问受限了". www.xiami.com. Retrieved 2018-06-02. ↑ "Music Videos - Vitas' official website". ↑ "Победителем NEWSmusic Pop Top 2007 стал Витас". NEWSmuz.com. 2007-12-28.